When you live in the Pacific Northwest, there are many great opportunities for organized road rides in the summer. The grand-daddy of them is the Cascade Bicycle Club's Seattle-to-Portland Bicycle Classic held each year in July. It's been going on for over 30 years. Last year was the first time I rode this epic 200 miler. I did it, like many, in two-days completing my first century on the first day and camping out on the grounds of a community college in Centralia, Washington. Rolling into Portland the next day was a real thrill as the thunder pounded overhead and a light rain greeted our overheated and sore bodies. We locked up our bikes, headed straight to the beer garden and drank a well earned cold one in a light mist and 80 degrees. Stunning. The bike I used for this ride was a 1974 Schwinn World Voyageur. And interesting story in it's own right, it is a traditional steel-framed touring bike that I had set up with a new drivetrain and wheels. It was trusty and speedy. But somewhere around the 150 mile mark near Castle Rock, WA (was it hypoxia? dehydration?) I started having visions… visions of doing this ride, yes, you guessed it, on a Raleigh Twenty! First, I replaced the 20" 406 wheel set that was original to this bike with a set of original, steel-rimmed 20" 451 wheels I had on another bike. This is just temporary. I have a new set of Sun M13 II 451 rims that I will be building up on a set of vintage Sturmey Archer hubs I have already re-built. Schwalbe Durano's will complete the wheels. Sure, I could have gone with newer hubs, but that would necessitate cold-setting the forks and rear drop outs. I just don't want to deal with that (lazy). 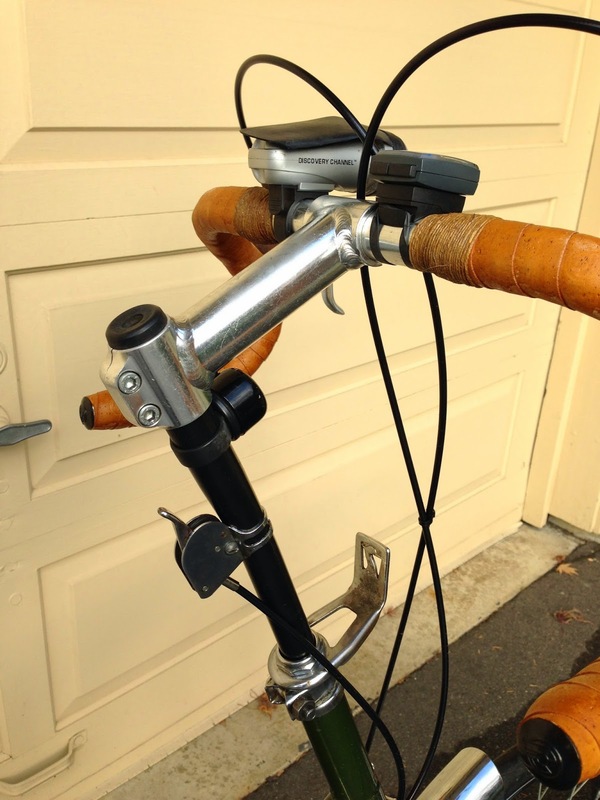 And this way I can brag to my roadie/spandex friends… "yeah, but I did it ON A VINTAGE 3-SPEED!" A large part of the lazy/poorman's modifications rely on another bike I picked up in a junk bin at BikeWorks in Seattle… for FREE! It was a ladies Raleigh Sprite 27 in white. Out comes the hacksaw! The original crank length on this USA Raleigh Twenty with 406 wheels was a paltry 145mm. It felt like I was riding a bike in the circus. The Sprite 27 had 165mm cranks which, while not ideal (I usually ride 175mm), were passable. 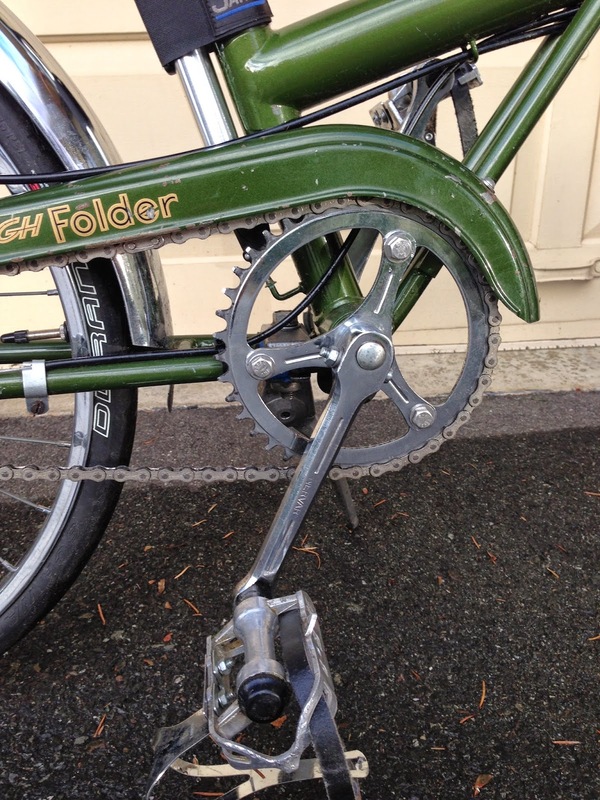 The drive side spindle on the Sprite had two chainrings. I removed the larger one and kept the 40T smaller one. I filed off the bolt guides on the spindle (they line up the two rings) and re-attached the smaller ring with stainless steel bolts and lock washers. Nice and tight. I miss the heron chainring, but this is at least ridable. A new 1/8" chain and 17T cog on the hub rounds out the drive train. This combination of 40T chainring and 17T cog on 451 wheels gives me a top speed of around 19mph on the flats with a cadence of around 100 in the third gear. Plenty for my style of riding. I may put a 15T cog on as the year wears on and I get stronger. This drive train means I never need to walk up hills! The lazy/poorman's approach says keep the bottom bracket as is and just add longer cranks from a cannabilized bike.. 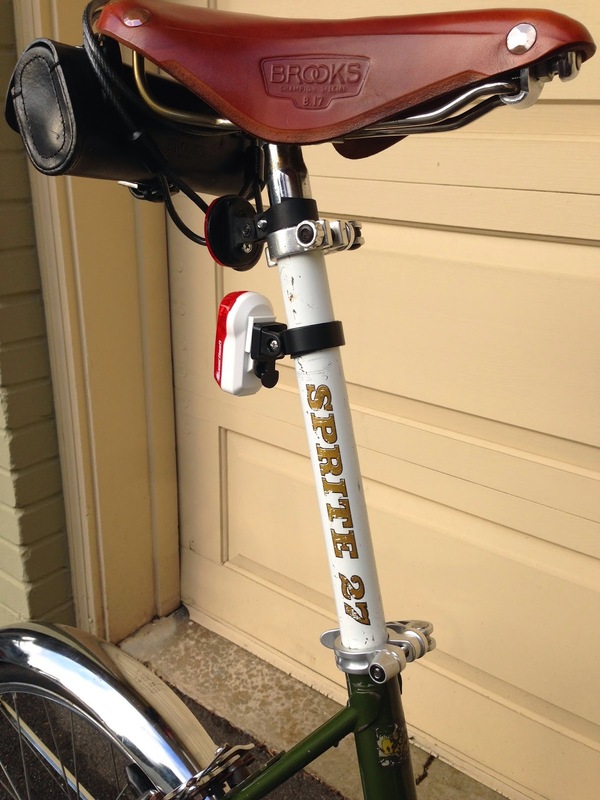 The Sprite 27 also donated it's down tube as a seatpost extender. I was going to paint it, but after getting it on, it just looked way too good as it was! This 1 1/8 inch tube slides right inside the R-20 seat tube. It goes a LONG way down there. Lots of steel contact. Same thing with the 1" steel seat post. It's nearly double thickness steel from the saddle to the cranks! No flex whatsoever. I'm 150lbs though and with heavier riders you may need to install a "palk strut." I felt I could get away without it… we'll see. But now, I get all the leg extension I need to ride strong and comfortable. Part of the reason this frame was sitting around was that it was missing its frame hinge bolt. I finally figured out how to make a replacement that keeps the frame rock solid. Get a standard 2" stainless steel bolt with the same diameter and thread pattern from the hardware store. Grind off the threads just under the bolt head the same distance as the bare section on the original frame bolt. This works perfectly now. 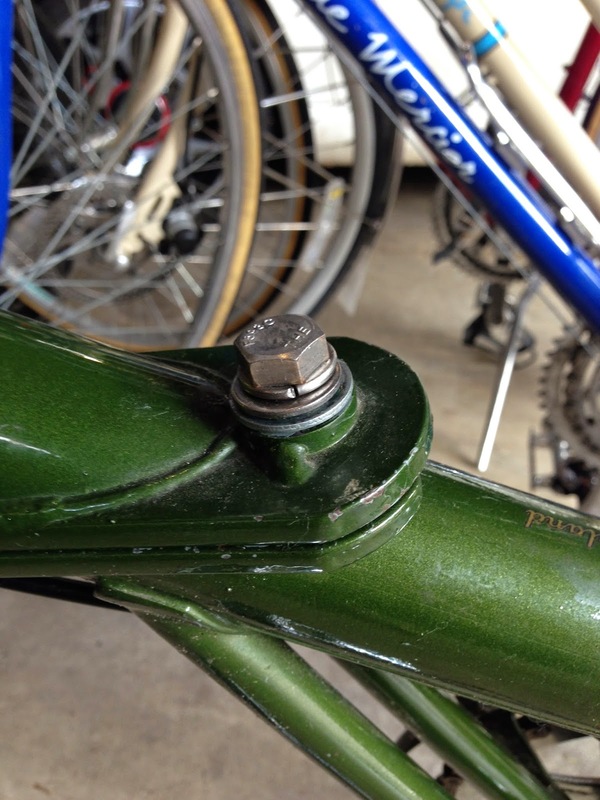 If you leave all the thread on the new bolt, the upper section and lower section of the frame will not seat properly and it will wobble. Grind the bolt and it cinches them right up together. Today, December 6 2014, I took this bike out for a 20 miler around Mercer Island, WA. It had rained all morning, but dried out enough in the afternoon. Average speed, 14 mph. This is my average on any road bike I ride! Overall I'm very happy with how this bike turned out. Once the new wheels are built and on, I'll post an update. Thanks for the comment Trav! The bike certainly is a lot of fun. The only thing I'd change (and it sounds kind of backward) is keeping the nylon bearing in the headset. At one point, I replaced the stock headset with an old Campy one I had laying around. The front end is VERY responsive, almost too responsive with he high pressure tires and narrow 451 rims. It's ridable, but has a very different feel from my other bikes. I really have to get used to it each time I ride. Still, a lot of fun and it gets LOTS of looks and comments.